TOFU MOM . . . and gravy! 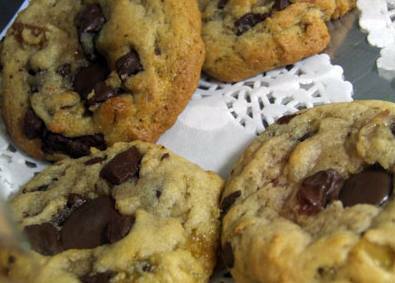 : BEST EVER, FOOLPROOF, VEGAN CHOCOLATE CHIP COOKIIES! BEST EVER, FOOLPROOF, VEGAN CHOCOLATE CHIP COOKIIES! Perfect Chocolate Chip Cookie recipes are tough to find, even if you're using butter, eggs and whatever else. My 12-year-old adjusted this recipe from an old family favorite one day when she was home alone and wanted to surprise me with some vegan cookies. We didn't exactly have "enough" of several crucial ingredients so she substituted - played around with the recipe and the end result was the most wonderful cookies EVER!! It is honestly AMAZING (hence the name). Now her recipe is famous among family, friends and her classmates, most of whom had never heard the word "vegan" before - at least now they associate the word with yummy cookie goodness. 2.) In a small bowl, mix soy milk VERY WELL (until creamy) with Ener-G egg replacer and flax meal using an electric mixer or hand (immersion) blender. Set aside. 3.) In another bowl, mix together flour, baking soda and salt. Set Aside. 4.) In a large bowl, cream together coconut oil, Smart Balance and sugars. Add soy/flax mixture and vanilla. Beat with electric mixer until smooth. 5.) Gradually add flour mixture to liquids. Stir in chocolate chips. You can add nuts, raisins, coconut, whatever... but we like them just as they are! This sounds like a really dumb question (and when it comes to baking, I can be dumb!) but could your replace the coconut oil called for in the recipe with coconut milk?... Since coconut milk is pretty high in fat...? Bazu; The coconut oil takes the place of shortening or Crisco. It's not a liquid oil but more solid usually. I think (only think, cause I haven't tried) that coconut milk would be too runny and therefor change the texture. Hey - coconut milk is good in just about anything though, give it a try! i tried your daughter's recipe because she's having a b-day party with a guest who is allergic to dairy, eggs, and nuts. they came out great! very tasty and chewy, only the cookies don't spread out the way other cookies do...and that's kind of important since we were planning to have all the kids at the party make their own ice cream sandwiches with the cookies (soy ice cream in the case of the one guest). if you preheat the coconut oil so that it's softer, will the cookies spread more? I don't know if melted coconut oil will help but I'm thinking probably not so much. My only guess would be to add (*gulp*) slightly more coconut oil as the amount of shortening or butter is what usually makes traditional cookies spread. We added a bit more soymilk one time and they spread a bit more, though were pretty hard to get off the pan intact... Someone also recommended using part Palm Oil/ part coconut oil, though if you don't have that handy, don't rush out to buy it... Let me know what works for you though. OMG!!! These were yummy!! I did have to add a few more tablespoons of liquid (I used water since I had no soy milk). The edges were crisp and the middle was chewy. Do not overbake them... do not wait for the edges to brown. Pull them out when they appear dry and they will be perfect. Thank you Tofu Mom and Miss Olivia Sprout!! Ok I may try these....I'm a glutton for chocolate chip cookies! I love my own recipe but always willing to try another. At least this one I'll only have to adjust for altitude...ususally its altitude AND vegan adjustments!